Surfside Cudmirrah Beach is located in the hamlet of Cudmirrah, near the township of Sussex Inlet. While it is a relatively small town, there is still plenty of exciting things to do in the town itself and the surrounding area. From watersports to cycling adventures, and even some bargain shopping, Cudmirrah Beach and Sussex Inlet have everything you could want from a coastal destination. So, if you are considering visiting the NSW South Coast for your next holiday, here are five great reasons to choose Cudmirrah Beach. We might be biased, but we think Cudmirrah Beach is one of the best on the NSW South Coast. The beach runs for three kilometres from Sussex Inlet entrance to Cudmirrah Village, perfect for long beach walks with your furry friend! Home to the Sussex Inlet Surf Lifesaving Club, Cudmirrah is also a popular surf spot with plenty of beach breaks and offshore north winds. Check Cudmirrah conditions here. If you need beachfront accommodation in Cudmirrah Beach, you can make a booking with us! Stunning Swan Lake in Sussex Inlet makes the perfect SUP location with its crystal clear waters and untouched natural surrounds. 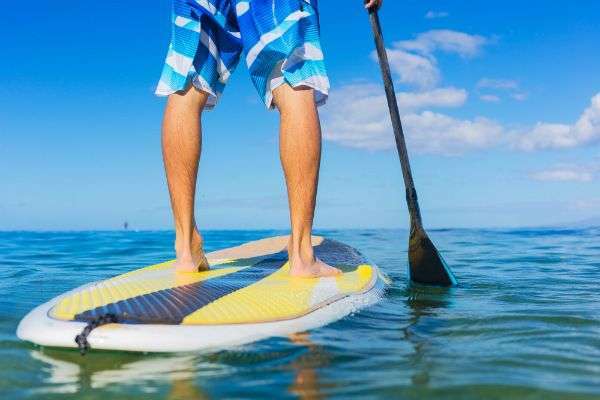 The professional instructors at Sussex Inlet Stand Up Paddle will look after all your needs, whether you’re a beginner or a seasoned paddleboarder. It’s a great way to spend the morning with the family (and squeeze in a workout too!). Whether you’re looking for top-quality surfing gear or feel like treating yourself to a new bikini, the Ocean and Earth Factory Outlet has something for everyone. Just some of the items you’ll find in-store include clothing for men, women and children, sunglasses, bags and hats. This iconic Australian brand has had its factory in Sussex Inlet for nearly 40 years and is still going strong. Check out the full Ocean and Earth Story or head down to the factory outlet at 12 The Springs Rd, Sussex Inlet. Enjoy cycling? Then you’ll love the scenic Walter Hood ride through Conjola National Park. It’s 11km one way (allow approx 2 hours), so you’ll want to make a day of it. Pack water, a hat, sunscreen and of course a camera or phone to capture all the fun. We recommend a picnic at Monument Beach where you can meet the resident kangaroos and wallabies. There is limited mobile reception in the National Park, so always let someone know your plans before you set off. If you’re unlucky enough to experience poor weather, Sussex Inlet Aquatic Centre is a great place to keep the kids entertained. Swim laps in the 25m heated pool, enjoy a snack at the kiosk or get involved in one of the aqua aerobics classes. There’s also an inflatable obstacle ride that the kids will love! Find out more about Sussex Inlet Aquatic Centre including prices and opening hours.